PRINCETON, N.J. – The No. 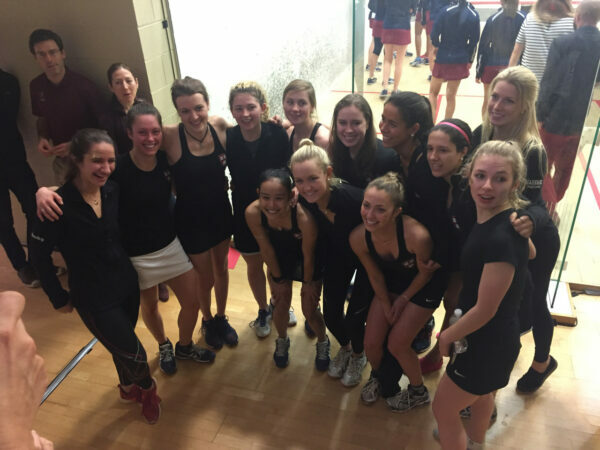 1 Harvard women’s squash team finished the season a perfect 14-0 as it defeated No. 2 Penn, 7-2, in the Howe Cup final Sunday afternoon for its third-straight national championship. The Crimson won the opening five matches, securing the title early against the Quakers. After the first wave of the matches in the Howe Cup final, the Crimson jumped out to a 3-0 lead. Seniors Katie Tutrone and Dileas MacGowan took care of business at No. 6 and No. 9, earning 3-0 wins over their opponents. At No. 3, sophomore Kayley Leonard came back from a 10-6 deficit in the fifth game, rattling off six consecutive points for the 12-10 win in the deciding game to give the Crimson a three-match advantage. Lissen (mom in background) Junior Alyssa Mehta and sophomore Sophia Mehta then clinched the title for the Crimson in the second set of matches. Alyssa Mehta fell in the opening game at No. 5 before rallying for three-straight victories, including an 11-2 win in the deciding fourth game, while Sophie Mehta swept at No. 8. Junior Sue Ann Young and freshman Amelia Henley rolled to wins at No. 7 and No. 4, respectively, in the final wave to secure the 7-2 win for Harvard. The Crimson will be back in action at the CSA Individual Championships at Dartmouth next weekend, March 3-5. Princeton, NJ — Harvard University defeated the University of Pennsylvania to win the Howe Cup and the 2017 national title. Today’s final was a rematch of the 2016 final between the Crimson and the Quakers. Coming into the tournament, it looked like Harvard’s title to lose. The two-time defending national champions had gone undefeated in the regular season, winning the Ivy League title along the way. Indeed, the Crimson hadn’t lost a match since January 2015, when they lost 4-5 on the road to Penn. This season, Harvard’s closest match was a 7-2 victory over the Quakers. Six of the nine contests that day had gone past three games, with four matches going to five games, giving Penn a possible route to a victory. Coming into the tournament, Harvard was seeded first overall and Penn, who had only had the one loss to Harvard, was seeded second. The Crimson powered through the first two rounds, dispatching Columbia 9-0 and Princeton 8-1. Penn had opened the weekend by sweeping Cornell, but they played a marathon semifinal against Trinity. 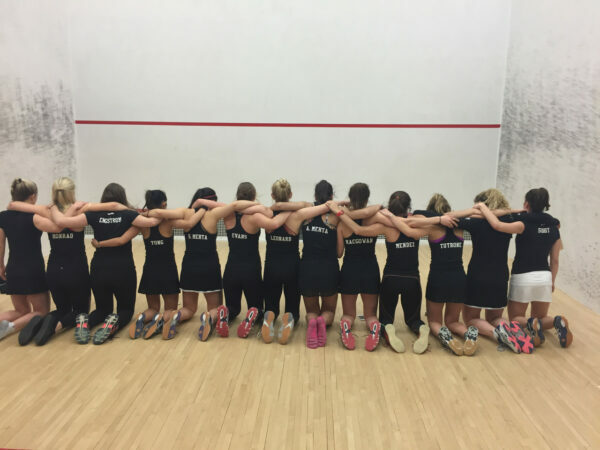 The two teams were tied through the last match on court, and Penn took the 5-4 win. Harvard had been dominant during the regular season and had had the easier trip in the semifinals. The Quakers, however, had some history on their side. The last two times Princeton hosted the Howe Cup, Harvard lost the final 4-5 in dramatic fashion, to Yale in 2011 and to Trinity in 2014. Could it be Penn’s turn for a dramatic upset? 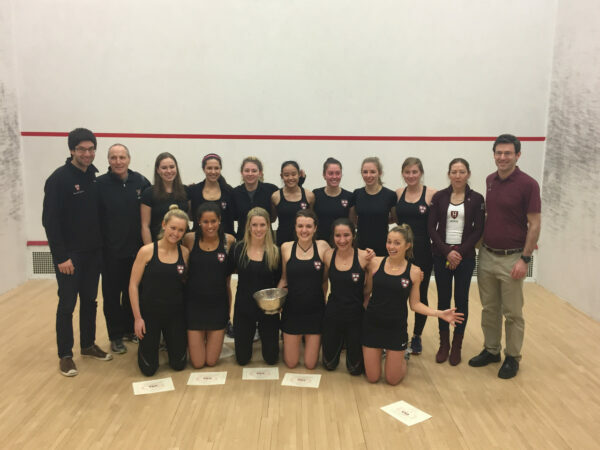 In the first round of the final, the match-ups were senior co-captain Dileas MacGowan (Harvard) versus Lindsay Stanley (Penn) at number 9, Michelle Wong (Penn) versus Katie Tutrone (Harvard) at number 6, and Kayley Leonard (Harvard) versus Marie Stefan (Penn) at number 3. The two Harvard seniors on court gave their team an early lead: MacGowan won in three games, and Tutrone claimed her match 13-11 in the fourth. Leonard and Stephan battled through five games, with Leonard saving multiple match balls to win 12-10 in the fifth, giving Harvard a 3-0 lead. 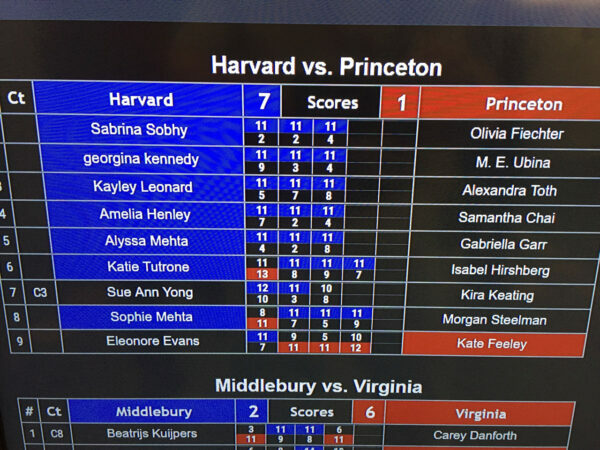 The second round pairings were senior co-captain Grace van Arkel (Penn) versus Sophie Mehta (Harvard) at number 8, Alyssa Mehta (Harvard) versus Jessica Davis (Penn) at number 5, and co-captain Mélissa Alves (Penn) versus Gina Kennedy (Harvard) at number 2. 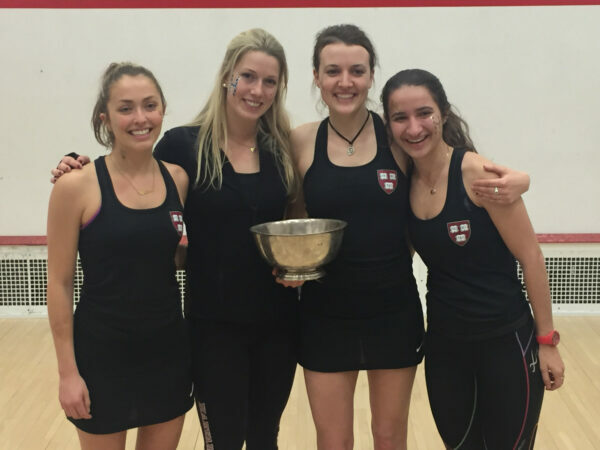 Sophie Mehta won in three games to bring Harvard within a match of the national title. Alyssa Mehta dropped her first game to Davis, but the Harvard junior powered through the next three games, taking the match with a convincing 11-2 win in the fourth. 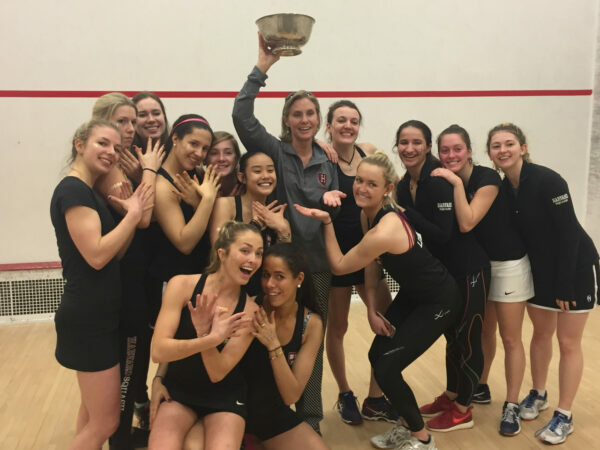 It had taken just five individual matches for Harvard to win their 17th national title, tying Princeton for the most team championships. Play continued even after the national title had been decided. Alves won her match against Kennedy. The third round match-ups were Sue Ann Yong (Harvard) versus Rowaida Walid Attia (Penn) at number 7, Anaka Alankamony (Penn) versus Amelia Henley at number 4, and Sabrina Sobhy (Harvard) versus Reeham Sedky Salah (Penn) at number 1. Yong and Henley both won their matches, and Sobhy and Salah played a thrilling match a number 1, with the Penn sophomore winning 12-10 in the fourth. The final score was Harvard 7, Penn 2. The Crimson are coached by Mike Way, the Gregory Lee ’87 and Russell Ball ’88 Endowed Coach for Harvard University, and assistants Luke Hammond and Hameed Ahmed. MacGowan and Caroline Monrad are co-captains.